Molybdenum (often referred to as 'Moly') is valued as an alloying agent in structural and stainless steels because of its strength, corrosion resistance and ability to hold shape and operate at high temperatures. Like other refractory metals, molybdenum has a high density and melting point and is resistant to heat and wear. At 2,623 °C (4,753 °F), molybdenum has one of the highest melting points of all metal elements, while its coefficient of thermal expansion is one of the lowest of all engineering materials. Moly also has a low toxicity. In steel, molybdenum reduces brittleness as well as enhances strength, hardenability, weldability and corrosion resistance. Molybdenum metal was first isolated in a laboratory by Peter Jacob Hjelm in 1782. It remained mostly in laboratories for much of the next century until increased experimentation with steel alloys showed moly's alloy strengthening properties. By the early 20th century, armor plate steel producers were replacing tungsten with molybdenum. But the first major application for moly was as an additive in tungsten filaments for incandescent light bulbs, which were growing in use during the same period. Strained supplies of tungsten during World War I led to a growth in molybdenum demand for steels. This demand resulted in the exploration of new sources and the consequent discovery of the Climax deposit in Colorado in 1918. After the war, military demand declined but the advent of a new industry - automobiles - increased demand for high strength steels containing molybdenum. By the end of the 1930s, moly was widely accepted as a technical, metallurgical material. The importance of molybdenum to industrial steels led to its emergence as an investment commodity in the early 21st century, and in 2010 the London Metal Exchange (LME) introduced its first molybdenum futures contracts. Molybdenum is most often produced as a by- or co-product of copper, but a few mines do produce moly as a primary product. Primary production of molybdenum is exclusively extracted from molybdenite, a sulfide ore, which has a molybdenum content of between 0.01 and 0.25%. The resulting molybdenum sulfide (MoS2) is then roasted at between 500-600 C°(932-1112 F°) to produce roasted molybdenite concentrate (MoO3, also referred to as technical molybdenum concentrate). Roasted molybdenum concentrate contains a minimum of 57% molybdenum (and less than 0.1% sulfur). Sublimation of the concentrate leads to molybdic oxide (MoO3), which, through a two-step hydrogen reduction process, produces molybdenum metal. In the first step, MoO3 is reduced to molybdenum dioxide (MoO2). Molybdenum dioxide is then pushed through hydrogen flowing tube or rotary furnaces at 1000-1100 C° (1832-2012 F°) to produce a metal powder. 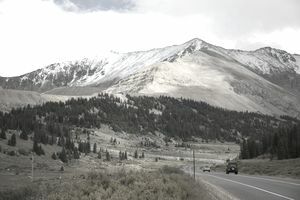 Molybdenum produced as a by-product of copper from copper porphyry deposits, like the Bingham Canyon deposit in Utah, is removed as molybdenum disulfate during flotation of the powder copper ore. The concentrate is roasted to make molybdic oxide, which can be put through the same sublimation process to produce molybdenum metal. According to USGS statistics, total global production was roughly 221,000 tonnes in 2009. The largest producing countries were China (93,000MT), the US (47,800MT), Chile (34,900MT) and Peru (12,300MT). The largest molybdenum producers are Molymet (Chile), Freeport McMoran, Codelco, Southern Copper, and Jinduicheng Molybdenum Group. More than half of all molybdenum produced ends up as an alloying agent in various structural and stainless steels. The International Molybdenum Association estimates that structural steels account for 35% of all moly demand. Molybdenum is used as an additive in structural steels because of its corrosion resistance, strength, and durability. Being particularly useful in protecting metals against chloridic corrosion, such steels are used in a wide range of marine environment applications (e.g. offshore oil rigs), as well as oil and gas pipelines. Stainless steels account for another 25% of molybdenum demand, which values the metal's ability to strengthen and inhibit corrosion. Among many other uses, stainless steels are used in pharmaceutical, chemical and pulp and paper mills, tanker trucks, ocean tankers, and desalination plants. High-speed steels and superalloys use moly to strengthen, increase hardness and resistance to wear and deformation at high temperatures. High-speed steels are used to form drill and cutting tools, whereas superalloys are used in the production of jet engines, turbochargers, power generation turbines and in chemical and petroleum plants. A small percentage of moly is used to increase the strength, hardness, temperature and pressure tolerance of cast iron and steels, which are used in automobile engines (more specifically to make cylinder heads, motor blocks, and exhaust manifolds). These allow engines to run hotter and, thereby, reduce emissions. High purity molybdenum metal is used in a range of applications from powder coatings to solar cells and flat panel display coating. About 10-15% of molybdenum extracted does not end-up in metal products but is used in chemicals, most often in catalysts for petroleum refineries.